You are right — I do get the horrors every now and then. Comes on like a cold wind. There it is, just a matter of weathering it. Alcohol doesn’t help that a bit. I usually go into the garden and work hard. At that moment Ritch and Tal Lovejoy came in for a cup of coffee and then I watered the garden and here it is dusk. A very quiet Sunday and I’ve enjoyed it. My hands are literally tired from moving rocks. And it is a fine feeling. It has been one of the dark days that I like very well — overcast and almost cold except that flowers like it and seem to be on fire in such a light. I think flowers’ colors are brighter here than any place on earth and I don’t know whether it is the light that makes them seem so or whether they really are. I debated strongly about whether to dress and go out to dinner or whether to cook something and stay home in quiet and determined on the latter. So I’ll close and send you more reports. I got to reading Auden’s introduction to the Greek portable and it is very fine. He is such a good writer. Have you read Lady Godiva and Master Tom by Raoul Faure? A really blistering study of a woman. I shall be going to Los Angeles with Kazan about the first of November and to Mexico soon after. Probably be gone for about a month. I have not worked on The Salinas Valley. I don’t want to now until everything is clear because I think I am about ready for it and I’m letting it stew. It would be bad if the whole conception turned out no good. But I’ll do it anyway. I am really looking forward to the doing of it, good or bad. I miss Ed and I don’t all at the same time. It is a thing that is closed — that might possibly have been closing anyway. Who can tell? Great changes everywhere and every which way. I still get the panic aloneness but I can work that out by thinking of what it is. And it is simply the breaking of a habit which was painful in itself but we hold onto habits even when we don’t like them. A very senseless species. There is no future in us I’m afraid. I can hear the music beginning to turn in my head. And by the time the spring comes I hope I will be turning with it like a slow and sluggish dervish or some mushroom Simon Stylites, a fungus on a stone pillar. The week I’ve put in planting — things I’ll probably never see flower – either because I won’t be here or I won’t be looking. I have no sense of permanence. This is way stopping-place, I think, as every other place is. I’ve made my tries at “places” and they don’t work. But this is a good way stopping-place and a good one to come back to — often. I awakened the other night with a great sense of change happening somewhere. Could not sleep anymore and all night the sense of change, neither pleasant nor unpleasant but happening. It hung on for several days. Gradually my energy is coming back a little at a time. It is so strange that I could lose it so completely. One never knows what he will do ever. Just now the rain started, very gentle and good. I hope it rains a long time. There has not been enough. I’m sorry I was so closed in, in New York. But I realized more than any time in my whole life that there is nothing anyone can do. It’s something that has to be done alone. Even with women, and that’s good, there is largely no companionship except for a very little while. This has been a long bleak day. I loved these letters, unknown to me before. In a strange way, because the voice is very different, they remind me of May Sarton’s Journals which I also find very life affirming, and which I sometimes read at night before bed -something in them, as in these letters conveys deep understanding and a way of being at peace in world despite everything – does that make sense? May Sarton! Avril, my dear, I didn’t know anyone remembered her. I’m a fan of May Sarton, and have been for some time. Thank you. Yes, what you say makes perfect sense. 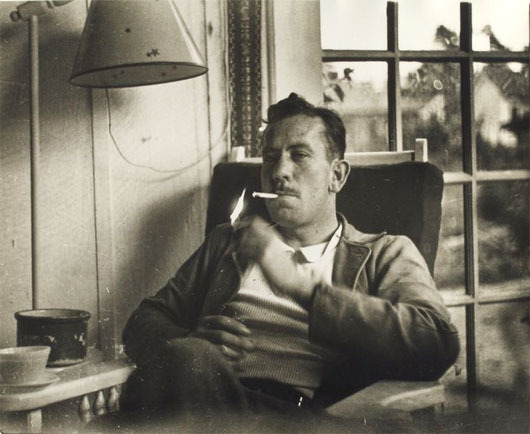 Thank you for sharing these – it was stunning to me to see how eloquently Steinbeck has described what many of us can feel. And thank you, Avril, for your comment prompting me to discover May Sarton’s journals! Thank you, Susan. Thank you for dropping by. For those readers unfamiliar with Steinbeck”s prolific letter writing output, I suggest the collection, Steinbeck: A Life in Letters. edited by Elaine Steinbeck and Robert Wallsten. This is a good, if somewhat edited, companion to Jackson Benso’;s biography, John Steinbeck, Writer. Hi Herb. It’s nice to meet you. Thank you for the book suggestions, neither of which, I regret to say, I’d ever heard of. No matter when I drop by your site, I always find that you’ve posted something I am happy to have read… A beautiful phrase I needed to hear or an unfamiliar perspective I can walk away and process. Thank you. If you don’t mind my asking, where did you find these letters? Were there more? …In the middle of this myself, and loved his words. Thank you for your thoughtful comment, and thank you for dropping by.